At some point since my “Part 3” post I managed to sneak enough shop time in to shape the feet for this screen. My original plan was to create a cloud type detail on the feet, as indicated on my drawing. But the more that I looked at the emerging assembly, the more that I realized that the feet needed an angular detail. So that is what I went with. On New Years day I finally concluded that the buying frenzy of Christmas should have dissipated. Which made my venturing across town to the Home Depot relatively safe for my one remaining nerve. I needed a piece of their mystery pine for the center panel of my screen project. My original intent was to find a clear, straight grained piece and apply the uzukuri finish to it. One I was at the Home Depot I began to cull through the stack, as I’m want to do, I my original plan went out the window. I rarely write of woodworking in philosophical terms. Even rarer still do I attempt to elevate woodworking, particularly my woodworking, by assigning artistic value to it. But…on that day in the Home Depot I was struck by a piece of knotted and twisted grain pine that I immediately felt drawn to. It looked as though a storm had begun to form within the tree and it was locked in place when that tree was harvested. 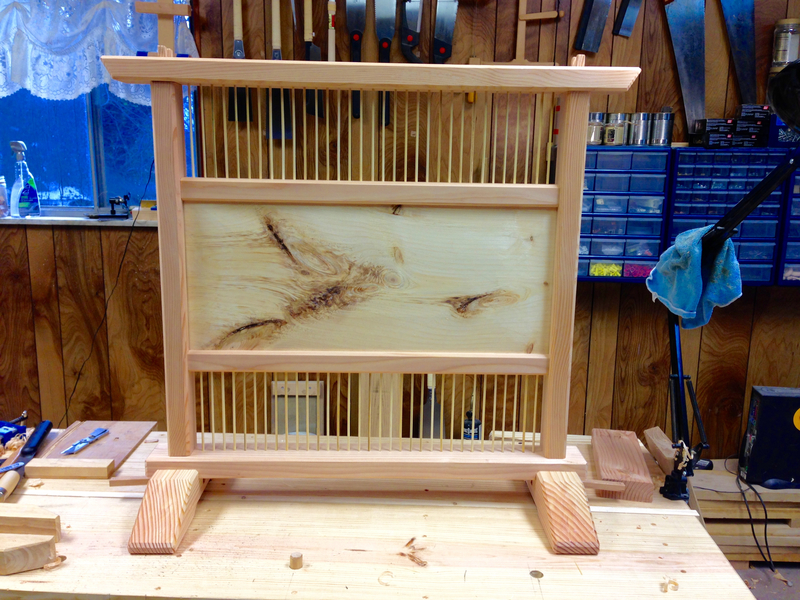 I immediately knew that this piece of pine would become the center panel of my tsuitate screen. I took my new found prize home and put it in the shop. Saturday I sized and planed it to fit the opening and grooves of the screen. Planing this gnarled piece of wood was not nearly as difficult as I had feered that it might be. 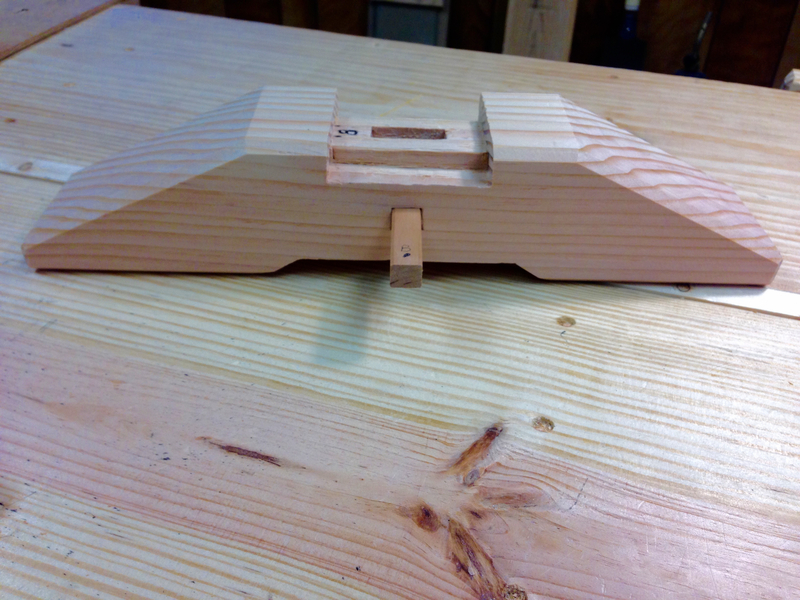 I sharpened my #4 plane and set it shallow. The plane balked at the knots and reversing grain with the first few passes, but soon began taking smooth, full-width shavings with minimal tearout. Thus the tempest panel was born. 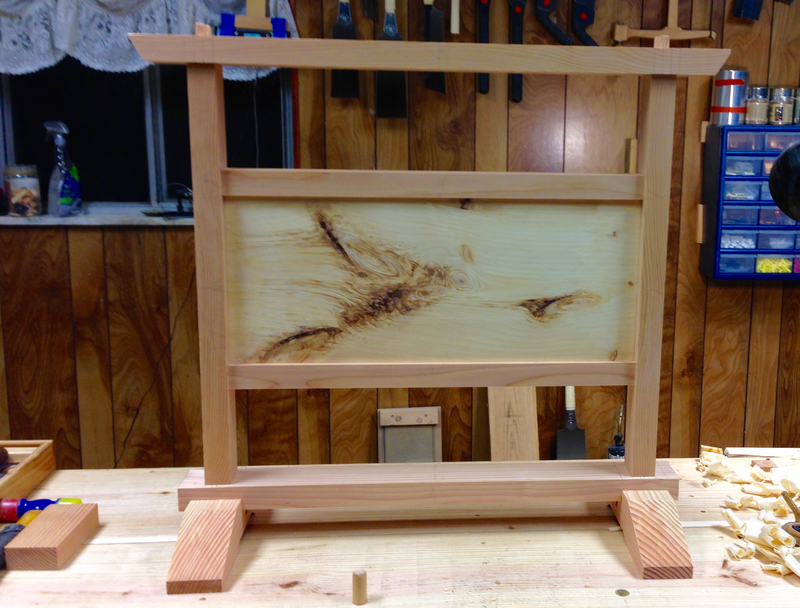 The next task at hand was to mark and drill the holes for the bamboo skewers that will fill the panel areas above and below the center panel. Using dividers, I stepped off equal spacing for the pegs. Each panel area worked out to have (33) pegs. That meant that I had to drill (132) shallow holes for the bamboo pegs. It sounds like a lot, but went fairly quickly using an eggbeater drill with masking tape on the drill bit for a depth stop. Once the holes were completed, I cut the required (66) pegs and installed them. One final dry-fit before starting the finishing process. That completes the construction phase for this screen. Over the course of the coming week I’ll begin adding the uzukuri treatment to each individual piece. Then everything will get a coat or two of Tied & True Original linseed oil. I’m adding the oil simply to bring out the color of the wood. I want this piece to take on a character of its own as it ages and the less finish the better. There is an entire discussion on this that brings in the Japanese idea of wabi-wabi, but I’ll leave that for another post. Once all of the pieces are finished I can assemble this screen one final time. I have one more decorative element up my sleeve that may or may not work out. So I’ll keep that one to myself until I get a chance to try it. 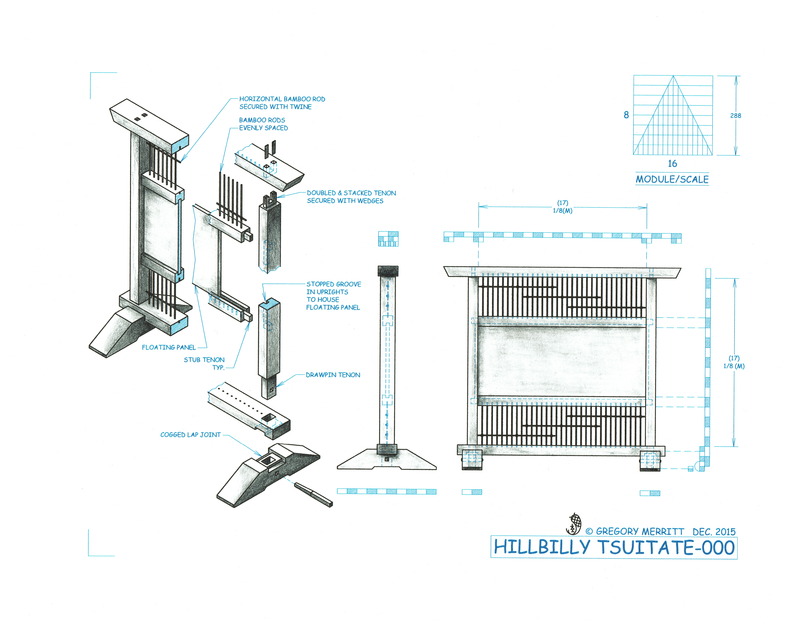 This entry was posted in Hillbilly Tsuitate-000 and tagged bamboo pegs, Japanese screen. Bookmark the permalink. This piece already looks very nice, without any finishing. The uzukuri treatment will burnish and seal the wood. A quick wipe with oil will darken the color slightly. Still not too bad as is for construction lumber and skewers from the grocery store. Oh, and excellent choice on the scarred pine. The piece is always now going to be about wood, orderly, and chaotic. A whole lot going on there. Stunning, wonderful work and great find on the center piece. Thanks! The panel was pure luck. All I did was seize the opportunity that was presented to me. Very interesting panel. How does it look on the other side? The other side is almost as dramatic. Once I complete the finishing process and final assembly I’ll post pics of all sides. That is looking really good. The dramatic panel was an excellent choice. Thanks Jonas! Sometimes I get lucky. “Tempest panel” – love it. 😉 …once I saw the board, I knew I had to use it. It’s stunning. I can’t wait to see it with the uzukuri treatment. I think that will give it a neat 3D effect. Thanks Brian! I’ve still got a bit to do before I can call it done, but I’m close. glad to hear that the “Categories” are helpful. Also good to hear that your getting some use out of the knot tying posts.